Saturday was cold and snowy, the first day of the storm system that was predicted to cruise through here for several days, which meant soup was on the menu for lunch. The snow was falling softly, one of those pretty snows where you’re happy to be inside but not dreading shoveling it off the walk. In short, a perfect day for soup. This is one of those “kitchen sink” soups. 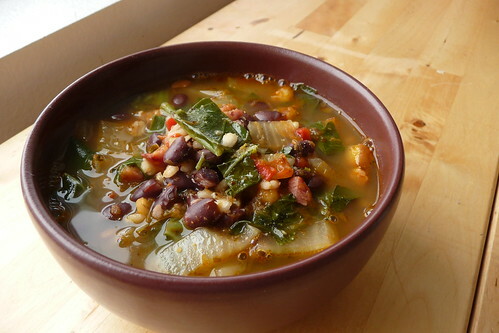 I was going to make my favorite Spicy Black Bean Soup but I didn’t have some of the ingredients, so instead, I just threw in what I had and wanted to use up. Soups are forgiving that way. And adding collard greens or chard adds a lot of nutrients and vitamins, not to mention flavor. So, in short, if you don’t have everything in the recipe, throw in what you do have. It will still be good. Saute bacon ends until the fat renders and the bits begin to brown. (If using ham, saute in some olive oil until lightly browned.) Add onions and saute until lightly browned. Add bell (or poblano or other) pepper along with carrot, cook for another minute. Stir in all of the spices, cook for 30 – 45 seconds, then add white wine and stir well for another minute. Add barley, beans, greens and stock. Stir well. Bring to a boil then reduce to a simmer and cover. Cook for 10 – 12 minutes. This entry was posted in american, dairy-free, gluten-free, one-dish, pork, recipes, soup, untranslated. Bookmark the permalink.